Change the world one pair of pants at a time, buying them from a democratic welfare state like the UK. It's easier to buy pants from countries that are cheaper for lack of a welfare state, but that doesn't reduce poverty. Im writing, because I have good reason to believe that Pants to Poverty may have gone out of business. In brief, (excuse the pun), I placed an order over 2 weeks ago, which has not arrived, and they have failed to reply to three emails, and their phone number is unrecognised. A web search revealed Facebook postings from several other customers who have had the same experience, going back to the end of June . Are you able to shed any light on what has become of this company which you currently giving a top ethical rating? Pants to Poverty is at the moment facing extremely difficult financial issues. I have therefore had to let all of my team go on sabbatical until I am able to re-engineer things and bring on board a new investor. It got so bad that I was unable to afford storage and shipping etc.. and so I have had to relocate all stock and set up a new system. One of my team  whilst on her sabbatical  became very involved in the refugee crisis across Europe. She asked for my support and we were very successful in our goals but then suddenly a pan-European movement took away our lives for the past month. [Calais is where a lot of people end-up fleeing the effects of free trade without conditions, which doesn't force anything on the badly-run countries they left]. I now have enough money to send you your pants and to all those that have been waiting. Following Guy Johnsons letter in your Nov/Dec edition (EC157) and the subsequent response by Ben [Ramsden] at Pants to Poverty, I thought it would be fine to order some pants. I have had plenty of their pants before though never via the internet. My order was placed on 11 Jan and I paid via credit card through PayPal. The payment went through but no pants, no replies to my emails, no functioning phone at Pants to Poverty and I am clearly very disappointed. It leaves a sour taste. Ed: Similar problems were reported by the Guardian on March 29th. It would be wise to avoid Pants to Poverty until further notice and we have removed them from our product guide on the website. Gaps in the documentation: What is Ethical Fashion? It's possible that Ramsden did a day job to support his business, because he wasn't on duty for months in a row, depending on interns, staff and contractors to run the business for him. One of the directors paid over £200,000 into the company accounts as directors' loans as well. Or else Ramsden travelled to India, as he wrote in his blog, then "a pan-European movement took away our lives", as he wrote in the "Pants on fire" statement. Linkedin now mentions work with C&A, the chain of clothes shops that closed in the UK. Whatever he did, he had the time and ticket to go to Calais when an ordinary ebay trader would be at home posting pants rather than saying"turnover was insufficient" in the 2014 accounts and taking orders in 2016 that would not be posted. Lots of businesses reach this point. It would be good if there were adult education classes available to people who are too old, young, or frazzled to juggle all the jobs in a business when bad at some of them and too poor to pay for experts and contractors. It would be good if there were training in all the specialised things like how to make shoes or underwear or web sites or photographs that people are willing to pay for. Unfortunately, after the banking crisis, the boom in development agency funding ceased, and when it had existed around 2005, it had not been spent on the vital things. It had been spent on training by Mr Ramsden and the others at Ethical Fashion Forum as part of some scheme to sort-out India which didn't work. Juno web design of Nottingham set-up the Wordpress and Shopify web site. Stock was at Sandbagheadquarters.com of Reading, a pick-and-pack warehouse that recruits bands on tour to help them sell Tshirts. There were 33 connected CVs on a Linkedin search of people and they keywords "Pants to Poverty" in 2017, including some employees. A colleague did web updates and changes, wholesale, some of the blogging, and customer phone calls. Finance juniors chased invoices. With all that subsidised and donated time and office space, it must have crossed Ramsden's mind that his firm could just post pants like the people on ebay who sell old Pants to Poverty stock now. He didn't write his reasons on the web site, dispite hopes of being "open source" about his supply chain in India. Ramsden told interviewers that he'd been a trader at school, had a very successful career in telecoms before living with a remote clan in a forest, then after a stint campaigning against UK trade, had borrowed £3,000 and sold £11,000 of pants in his first six months before going on an adult education class in how to run a small business. He also made grand claims for the scale of his operation in India, stating that he bought all the cotton from Lebed village and funded two salaries in the area on a page headed "our farmers". Linkedin reveals that very few of the people sharing an office and public funding at Ethical Fashion Forum had much to do with the rag trade. Pictures show no sewing machine in the office. It was an office used for exactly ten years by a group of Government or London government favourites, in a building funded by the London Development Agency. The common theme of people sharing the office was of people who hoped to become self-sufficient in future, from underwear sales, membership fees, referral fees from consultants, and a steady stream of scrounged taxpayer-funded grants from any possible public body. For example, Ethical Fashion Forum founder member Solitaire Townsend of "Swishing", a clothes-swapping movement, is also a director of Futerra Communications, a major PR contractor to government, researcher for government and advisor to individual ministers in the 2000s. "It's complicated", and official told parliament. Tamsin Lejuene was presented as founder of Ethical Fashion Forum and importer of dresses for a firm called "Juste", that never quite existed, and the hype continues on the list of Ethical Fashion Forum founder members' CVs. Few of them are part of an industry they label "ethical fashion", with them as the "industry body for ethical fashion", always ready to offer an interview, referral to a consultant or a £200 guest speaker. Attendance at a master class and lecture day was £240. A common theme would be "what is ethical fashion? ", or "ethical fashion definition". "Today, Pants to Poverty is a leader in sustainable fashion for introducing socially responsible supply chains. ", says the Ethical Fashion Forum web site, offering Ramsden as a speaker or consultant, which must be useful because one of his few sources of income for a while must have been fees for consultancy and guest-speaker events where he claimed to be successful. When the staff left, Ramsden left the web site was left un-changed with the same stock and job-ad for a year or so before disappearing, with pages archived as late as the 10th of May. So someone who would get any ebay account closed for being hopeless was presented to the press as all the kinds of words that were used until things went wrong, and for some reason the press agreed and took a long time to take him off their lists of top suppliers, guest speakers, competition-judges, and next award winners. One of the few assets that Pants to Poverty still had was extra-ordinarily sympathetic coverage from a group of journalists as above, which begs the question why they didn't report UK manufacturing like Mary Portas' "knickers to unemployment" project in the same way. "Disappointing news ... we spent the last several months with lawyers, accountants, my own team including ... an MBA... " Then by email, when asked for a copy - "... there are some structural problems with the P2P model (mostly supply chain and distribution, but also some finance issues) - we found that 30% of sales in the models were coming from "other" which was unidentified and where all the profit was (and in fact break even....) and other issues." Then, offered a list of UK manufacturers who could help reduce poverty in the UK, including Fairtrade, Flint replied "I was not aware that the UK grew organic cotton or had a Fairtrade supply chain?." There was no question and answer section on the pitch, nor audited accounts Large companies devoted charity work to make sure of that. "Ben Ramsden defaulted... Money lost", says a note on the Bonk of Pants web page by John Otters from the Netherlands, one of the listed investers. The rights of a limited liability company were used against other people. The company ceased to exist and was replaced by Pants to Poverty, nothing to do with debts from the previous limited liability company of the same name. Tentative figures of pledges received suggest up to £58,365 of investment. Lawyers Hogan Lovells advised on how to avoid accountability, assuming that the organisation and investors knew what they were doing and not taken-in by government-backed PR. A student from Beijing Institute of Clothing Technology, interning at a Chinese fashion PR company, did the animation. It isn't stated how that contact was made. Investors were a little more savvy in spotting vague security, blurred boundaries between descriptions of what Pants to Poverty did and what a large Indian farmers' co-operative did, and lack of detail about previous loans. The pitch is like some of the ones on Funding Circle that say "customers coming soon ... help us expand". Ethical Consumer magazine's guess was that they had "an effective if not explicit policy at addressing workers' rights", based on a look at the web site. A wholesale catalogue made similar claims and persuaded some shops in Germany to stock the brand. The company only raised about half its hoped-for £100,000. The Bonk of Pants' was devised in the face of financial regulator stipulations, which do not allow the words  Bank  or  Bond  to be used. So for the bonk was born! What is the social/environmental problem / issue that this project will address? At every stage of the supply chains of the global fashion industry there are regularly huge exploitation of people and planet. An example of the worst cases are when farmers are driven to suicide when they cannot sell their crop for the cost of producing it with unnecessary pesticides, lose their land, dignity and will to live. Another example could be the draining of the Aral Sea due to over use of water. Another could be sweatshop labour keeping people trapped in the prison of poverty. The list goes on! One of the biggest issues is that people think that this is just the way that things are. This is where we come in and have built an amazing value chain community beautiful from cotton to bottom to prove that fashion can change the world! HOWEVER, this is based on trade, and without trade it wont work. So the Bonk of Pants campaign will act as the catalyst for our amazing programmes to scale and act as the catalyst for transformation across the industry. Sweet dreams are made of this! According to the World Health Organisation one million people are hospitalised and 20,000 farmers in developing countries die every year from pesticide poisoning. Although pesticides are used globally, 99% of the related deaths happen in developing countries. If farmed inefficiently, up to 30,000 litres of water can be used to harvest just 1 kilo of cotton fibre. 500,000 children are involved in forced child labour in cotton seed production in India today. 8 years ago there was no GMO cotton seed in India. Today it represents 92% of all cotton seed and costs farmers c.100% more than other varieties. Total CO2 emissions for the textile industry are estimated to be 18.72 million tonnes a year and in India the sector uses up 9% of all of the countrys available energy. Dyeing 1 kilo of cotton typically uses 100 litres of water. 60% of energy consumed during the life cycle of an organic cotton product comes from caring for the product- washing, drying and ironing. We have spent the last 7 years rebuilding the textiles supply chain to prove it can be sustainable. Weve done this, and so now need to scale it. To scale it we need to invest in it and open up our value chain community to consumers as investors. Hence the bonk! No other brands we know of can trace their supply chain back to seed like we can. Nestled in the heart of luscious hills criss-crossed with rivers are the villages of Semla, Banjipali and Kuibahal in Orissa who the pants bonk will enable us to work with forever. Surrounding the villages as far as the eye can see are miles and miles of beautiful organic farms supported by the company that the farmers own: http://www.chetnaorganic.org.in. Sourcing our cotton directly from the villages supporting them on education programmes, Fairtrade premiums and much more, we then transport the cotton to production with no child labour and only with paying fair wages to workers at our amazing garment partner http://www.armstrongknittingmills.com. Through carbon neutral production, a new real living wage and empowerment programme, and much more, they manufacture our gorgeous underwear and together with Chetna form the basis of our value chain community. Were also working with big businesses like Deloitte to build brand new impact measurement tools so that we can quantify and communicate the social, environmental and financial profit from cotton to bottom to all stake holders. 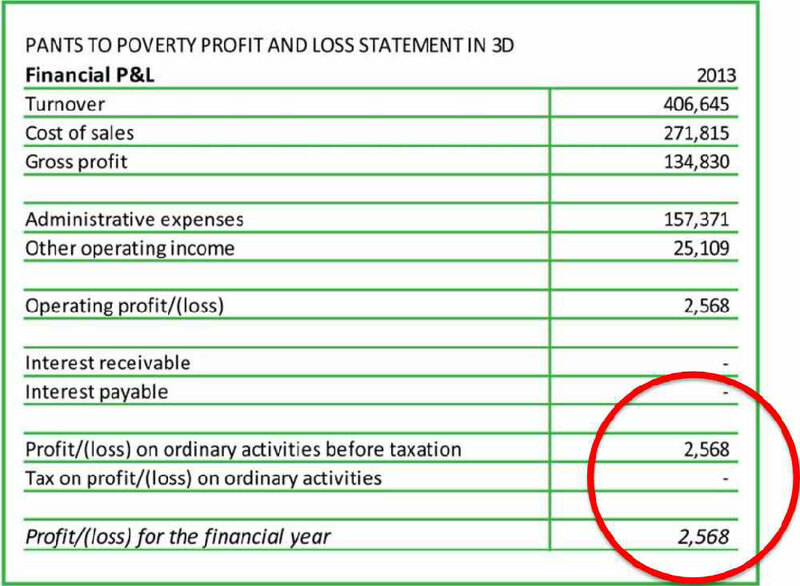 This is called our 3 dimensional profit and loss statement! However, we are a social business and not a charity, and so the only way to create and expand on our impact to expand our value chain community and really prove that our way of social business is better business, and, ultimately well do to old business what new media did to old media! We need you to make it happen! £100k in 100 days Our business currently maintains a net 15% financial profit achieved through the dedication and passion of our staff, a small grant from Unltd and some very kind people lending us funds to assist with cash flow [?] - . However, the increase in capital created by the successful completion of this campaign will move us a lot closer to our aim of becoming the greatest underwear brand on the planet, we just need your help to get there, providing you with many great benefits in return. Launch the brand into leading department stores in the UK, Scandinavia, Switzerland, Japan and Australia. Launch a series of value chain community programmes coordinated by our sister charity Pi Foundation to scale these solutions well beyond the impact of our pants. Engage and encourage other retailers and brands to buy textiles through our value chain community. Roll out new website linking farmers, factory workers, retailers and consumers into one online community. Democratise the business so that it is owned and governed by all of the stake holders within our value chain community, embracing the factory workers, farmers, lenders, consumers, staff and retailers. £20,000  Build an integrated IT infrastructure to embrace all members of the value chain community. This would normally cost over £40,000+ but weve got a discount! £10,000  New sales and marketing campaign linking the farmers, factory workers and retailers to create huge social, environmental and financial benefits for some of the most marginalised farmers on the planet. £45,000  Working capital to cover duty and VAT payments when stock comes into the country. Profits from the sale of our pants will then be donated to The Pi Foundation (our sister charity) to go towards programmes such as setting up and scaling farmer owned seed companies and developing empowerment programmes in garment factories to generate a real living wage for all workers. Italic text is a quote from Pants to Poverty's bond prospectus, which was tipped by The Guardian as an example of how to help such organisations. There is no reference to anything like national insurance in the UK or in India, or promoting good tariffs or goods made in the UK. Ramsden also won a global leadership award - it isn't said how many people applied - for a series of sales points which he tried to put in financial terms. The trouble is that you can write anything you want into a chart like this and assume anything you want about your competitors. He takes as an example the only year in which he declared a profit. Pants to charity, pants to funders and pants to taxpayers could do as names for this section. Public sector funders awarded small grants and a lot of PR opportunities to Pants, at the expense of other companies such as Remploy, or any company making goods in a democratic welfare state. The kinds of companies which get help from EU regional development grants to do things like run trade shows or do training in countries like Spain or Italy or Portugal. But in the UK, similar budget headings were diverted to this stuff. Where direct grants were made, they were at the expense of any other payment that government makes. At some point, somewhere in the hierarchy, were elected MPs and ministers with their political advisors and enthusiasms and view of the world. So, as voters, this is what we got. It's harsh to say that the funding groups like Ethical Fashion Forum and Pants to Poverty was funding fibs, but that is the pattern of seminars by Ethical Fashion Forum, statements by their director Claire Lissaman, statements by Pants, and teaching materials by the Otasha educational charity that supported both. The fib was to say that UK production is not as ethical as whatever else. The people who paid were people who want to work in jobs like textiles in the UK and to prove that it can be done in a welfare state. Example fib: "There is only one large scale factory in the world (so far) that pays all workers a real living wage", a statement about Armstong Mills in India. This kind of PR line was paid-for buy UK taxpayers and a few underwear buyers. We also had to pay in lost tax revenue and industry disruption when a very similar firm to Armstrong Mills, called Jaytex, closed for lack of interest in August 2018. Their problem was how to dye sufficiently small quantities of fabric at a profit, and most people reading this could design some kind of dye house for a single roll of fabric. The problem was that nobody was sufficiently interested; too many people had gone to fashion college and read about the value of their wonderful intellectual property, and Ethical Fashion Forum. UK taxpayers had to pay to be lied-to through a series of small subsidies and losses. The people who paid were all of us as taxpayers, apart from the other bills we face in the cost of collapse in the textile industry. Appareantly the bills were for teaching. That teaching effort seems to be the main thing in Pants accounts that would not be in the accounts of another Fairtrade importer. It looks as though Cabinet Office officials hope that the firm would cook-up a way to finance good works with public bonds, and persuaded various companies to help, when the reality was less useful. Pants to Investors was the next fib - saying they would be repaid when an invester called John Otters says they were not paid. Pants was not responsible for all statements by associated companies - such as the one on Terra Plana's web site that "China is arguably more democratic than the UK", but it shared subsidy publicity and training seminars with other Ethical Fashion Forum supporters. Ethical Fashion Forum would pretend to be the industry body for ethical fashion and invite Pants, who shared an office, as a guest speaker to share their seminar funded by new members or the Department for International Development or Business Link or whoever they could persuade to send them a cheque. Even if teaching is true, it is hard to value. Every teacher knows that good teaching requires keen students, so teaching offered as some kind of donation, then valued for the purpose of funders is a slippery concept. For example, there was a two-day seminar run on how to write procurement bids with environmental benefits, run by a London voluntary sector contractor to the London Development Agency and EU a year or two ago. For a two-day seminar to a crowded room, they valued the session at over £1,000 per attendee for the purposes of accounting to the EU and London Development Agency, or less for the people who dropped-out after day one because it wasn't specially good or wanted. This wasn't run by Ramsden, but he did work with a consortium of further education colleges to run an Apprentice-style competition to sell pants. Looking at the videos of contestants on you tube, it's clear that they haven't learned the sales points of Ramsden's product. Asked what they've learned, some pause a while and say "teamwork?". I don't know if there are any Ofstead reports on the process, which ended after three years. Ethical Fashion Forum happened to win a contract themselves, to Business Link, to advise people in London how to run a small business. It was run in association with Newham College. I don't know why, but it wasn't repeated. A Dfid-sponsored online course in buying and selling "ethical" products is reviewed as wooden. Teaching materials from an associated charity, which supplied interns for Pants, are blatantly untrue; they are an attempt to stop people buying British products, based on lies. The charity pulled-out of the project. Pants to journalists and funders was another fib, I imagine. Once the pattern of fibs is established, it becomes harder to believe the backstory that the founder was a man who gave up a successful telecoms career in the far-east to devote his talants... This is a man without an ebay account. He may be great at letting a communal thought "take over", which is nice, but not what was reported in the press. Pants to buyers was the final fib. The founder wasn't willing and able to update a Wordpress web site he'd paid Juno web design to manage, or manage the stock. This happened in 2015 but he carried-on bluffing and getting publicity right into 2016. There is one part of the accounts simplified-out, Aldi's German branches sold some clothes from Armstong Mills made of organic Fairtrade cotton - presumably from Chetna. Nudie Jeans too.The accounts don't show what extra benefit a Pants product has compared to an Aldi or Nudie organic Fairtrade one. They don't detail the cash payments and they don't say if there is some clever way of withholding the Fairtrade premium price for cotton and then paying it as part of a charity donation. Presumably, if there is a difference between Aldi Fairtrade organic and Pants Fairtrade organic, it is in the teaching. Half UK budget deficit 'is down to job destruction in older industrial areas' - Report finds that legacy of hollowing-out of manufacturing in 1980s is far more people claiming incapacity benefits This is a Guardian article about the costs to society of factory closures, not mentioned in pants' training and education, that UK taxpayers funded. A supply chain already exists to make clothing and pay taxes towards a welfare state. The price would not be much different, the benefits paid-for would include an NHS and universal secondary education, and there would be no need to let people down by trying to manage a slow supply chain with decisions made months-ahead to allow production on the back of the globe. 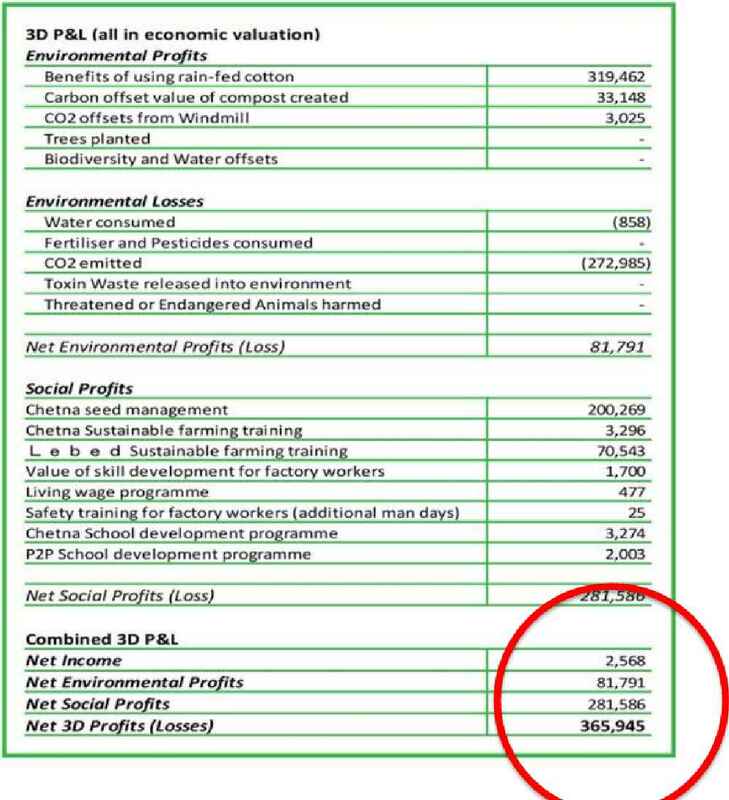 A quick look at reports from Skillfast, the sector skills organisation that includes textiles, shows reductions of 43% in VAT registered companies weaving, knitting and making-up fabric into garments, so far as can be guessed from the data they give to VAT offices from 2002-2008. I don't know if that's turnover or the number of VAT-registered units, but 43% was a lot before it went. Looking at the Armstrong Mills and Chetna Organic web sites, it turns out that they supplied a fabric manufacturer in Hungary, which went bust in September 2016. A fair attempt at this thing called "accounting in 3D" would try to quantify what social insurance the Hungarian mill supported that the equivalent production in India supported less or more, a subject few people know about and which these accounts obscure even more. In India there is the cost of diverting attention away from the need for smart tariffs that force the Indian government to cut its space programme and expand its existing national insurance programme to cover self-employed farmers or people who have never worked. Where the fair trade scheme allows farmers to vote on what to do with a fair trade premium, it's reported that they vote for schemes like this on a private local scale, but these can't cover people who are out of work so a national scheme would be better. This isn't an argument against buying a fair trade or an organic product from India if it has to be bought from India anyway, but it is an argument against bigging-up the supply chain with words like "ethical", and keeping quiet about the possibility of smarter tariffs. If the idea was to help people in India, a welfare state would help them a little bit more wouldn't it? With help from other countries via tariffs or public education? 02/06/14 charity report         29/09/13        "        "        "
11/04/14 charity report         29/09/12        "        "        "
30/07/12 charity report         30/09/11        "        "        "
no report              30/09/10        ?        ? Check-business.co.uk/business/06445650/pants-to-poverty-ltd - negative margin after the cost of hype complexity & contracting-out, despite low pay. Other UK pants suppliers try to do everything themselves from home or an industrial site and to keep things as simple as possible, whether they are manufacturers or wholesalers. tandfonline.com/doi/abs/10.1080/14616688.2017.1417471?journalCode=rtxg20 is research used by Robin Biddolph on courses about social enterprise and tourism at University of Gothenberg, based on his Cambodian research. This site - pantstopoverty.org.uk - might get a mention and if it does it will probably be alongside other work about the 2005 G8 protests where Pants to Poverty was a slogan. In August 2018, Ethical Fashion Forum finally pulled the plug on their website, founded with some 20 signatures in support but claiming to represent "thousands" and be "the industry body for ethical fashion". This is an example of the kind of thing they wrote on their site. 12/05/16 Flint's rejection of the company as a gift is posted on the Flint web site confirming negative profit margins as a reason. Linkedin reports the company as running till April. 29/03/16 Guardian article quoted below: "Pants to Poverty looses its ethical stance"
23/02/16 "I placed an order with the online retailer Pants to Poverty.... It processed the payment on 23 February and I received an order confirmation stating that the pants should be with me in a couple of days. Two weeks later the order hadnt arrived, so I emailed three times. No response. I also called the phone number on the website and was told it was out of service. I Googled and found some information from the owner that hed had to lay off staff and take everything in-house so to bear with him. None of that was communicated to me in person. Ive had zero information on my order. " "When Trading Standards visited its London office following a number of complaints from out-of-pocket shoppers, officers found it empty." " 'The buildings owners say the trader left about a month ago with no forwarding details,' says a spokesman for Tower Hamlets council. 'Were advising Companies House that we believe the address to no longer be valid.' ". As a kind of ebay seller, Ramsden would have had paypal orders comeing-in with the option to print postage from Paypal. He would have had to update the web site to show only things that were in stock and refund un-stocked orders otherwise. Then post the available pants at any post office. However he explained in a note to Ethical Consumer that he'd been in Calais working with a charity. There is online video of him there. Which could explain why Pants to Poverty doesn't have an ebay account. If so, a person funded by Business Link to provide small business training in Tower Hamlets is the same person who can't run an ebay account, but that's a guess.
. Ethical Consumer Magazine quotes an explanation below, which is that Ramsden's "in house" system involved going to Calais for some filming while working as a one-person business. He could have done with this kind of training if he was exhausted, trying to do jobs he was bad-at and had left to other people before, and working-out how to do things on a zero budget. As Business Link trainer maybe he should have advised himself. 25/01/16 How to Build a Sustainable Fashion Business - a course comissioned by the government training organisation Creative Skillset among eight from a budget of £200,000, or £25,000 each. They commissioned it from the people who have shared platforms and shared an office with Pants to Poverty for ten years. 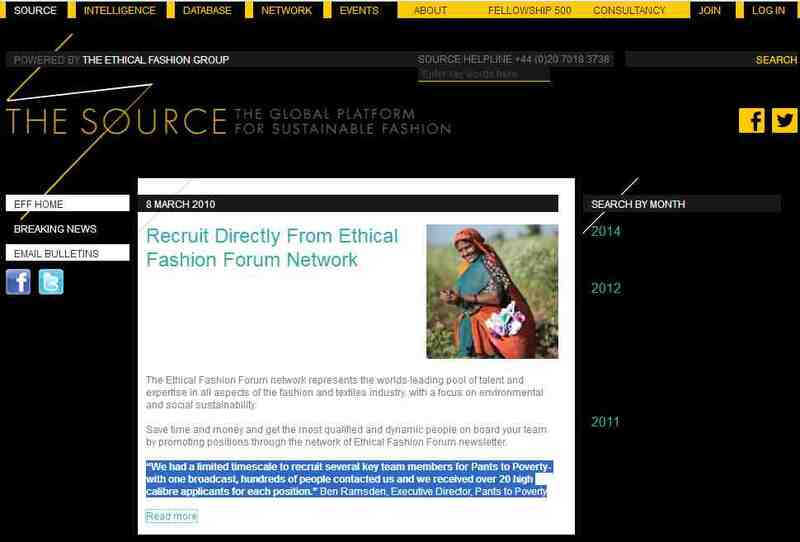 "Ethical Fashion Forum, the global industry body for sustainable fashion. Since 2006, weve been helping fashion professionals achieve commercial success, while maximising benefits to communities". Ethical Fashion Forum share Pants' contact book and a globalised view of the world which ignores things like the welfare state or human rights in different countries as a reason for boycotting or buying. Their CVs show little to do with manufacturing or membership organisations. Click some of their names on Linked-in and you see the same crowd of Nike-sponsored academics, consultants, and SOAS masters degree students, all grabbing desk space at the subsidised office in Rich Mix, 35-47 Bethnall Green Road. One of the speakers is a Nike consultant who once said "you can't compare countries", when asked about buying from China and warned against buying from the UK on ethical grounds, as does Ethical Fashion Forum on its web site. Another is a long-time student, politicians research assitant, and freelance writer. Trailers look like an advertising slogan for a political party. "This course will not run again", says the web site. 31/10/15 this was a new limited liability and company number, but easily recognised as though the same. The firm didn't state company details on their site. 00/10/15 British Council bus promotion of Ethical Consumerism in South Korea, September 2015, linked to a Cabinet Office grant programme administered by the British Council, for training social enterprises overseas. The British Council declined a request for background documents. 20/09/15 Ramsden videos from Calais to appeal for funds for a charity. 00/03/15 Ethical Consumer viewed Pants to Poverty website, www.Pantstopoverty.com, for the company's supply chain management policy. The company made pants out of Indian organic cotton and had a factory in India. The factory was said to be working towards driving forward with a brand new empowerment and real living wage programme for all of the workers in the factory. Due to the fact the company had a turnover of less than £8 million and had an effective if not explicit policy at addressing workers' rights within its supply chain, it received a Ethical Consumer's best rating in this category. This is a better rating than for companies that make things in a welfare state like the UK. See also /#pants-orders below. 26/02/15 Unchecked record - might be interesting if it counters the Nike-sponsored All Party Group for Ethics and Sustainability in Fashion. Not a single UK manufacturer is asked to speak, so the thing might not be interesting. "Fashion Revolution" and "Centre for Sustainable Fashion" appear to be the Nike -sponsored department at London College of Fashion that uses words like "summit"
"Fashion Revolution worked with Mary Creagh, Shadow Secretary of State for International Development, to put on Fashion Question Time in the Houses of Parliament in order to address some of the most pressing issues in the fashion industry. From the human cost of fast fashion to reshoring British manufacturing, from the language of sustainability to the mind-set around consumption, questions were raised, viewpoints were challenged and solutions suggested." 14/10/14 Ramsden chaired a debate at Brighton Fashion Week, alongside Ethical Fashion Forum who shared the same office, and two MPs. 28/07/14 Judgement against for £902, "unsatisfied" at the county court.. Other sites show online complaints about the warehouse and distribution company - Sandbag - about how it distributes generally so the problem might not all have been Pants' fault. 00/07/14 Judge of the Ethical Fashion Award, London Graduate Fashion Week - quote from the operations director's CV on Linkedin ... "Public speaking at conference, catwalks, workshops and other events"
Social enterprise underwear brand, Pants to Poverty, raised a total investment of £58,365 from over 100 supporters through social crowd-funding website, Buzzbnk. The money was raised through bond-style deal, enabling the enterprise to expand their operations with investors getting their money back plus 10.2% interest per year of which 3.0% is payable in cash and 7.2% in pants. People Tree is a leader in ethical fashion. When you wear People Tree clothing, you feel confident knowing your purchase has made a difference in the world. Today on the People Tree blog, we are all excited about the brand new Pants To Poverty range! The UKs leading sustainable underwear brand have been very busy and are launching their new Fashion Revolution Collection, shot at their birth place  The Royal Exchange in the heart of London. They are good friends in the Fair Trade movement and theyve been making [sic] glorious Fair Trade and organic pants for nine years, since their first collection as part of Nelson Mandelas Global Campaign to Make Poverty History. This year Pants To Poverty were part of the global Fashion Revolution Day campaign, which mobilised thousands of people around the world to help prevent disasters like Rana Plaza from ever happening again. A cause everyone here at People Tree fully supports. In London and in India they held The Pantrepreneur Challenge, where the winners travelled to meet the makers of their amazing pants. 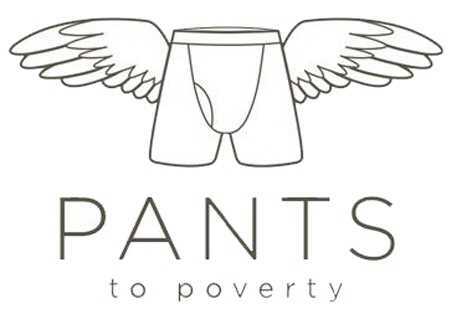 Pants To Poverty are an inspiration, they want to raise undie-wearness and change the world! Thank you for reading and from everyone at Pants To Poverty and People Tree  as Pants to Poverty love to say HAVE A PANTASTIC Day! Towards the final year of my Fashion Design and Technology Degree at the Arts University Bournemouth I started to look into sustainable fashion and used the concept as the focus for all of my work. My final project involved the creation of a new brand, KNOWMORE. The brand aimed to tackle key issues in fashion by educating and informing consumers, whilst also using incentives to change their behaviour and encourage the fashion industry to adopt positive change. My work was recognised at London Graduate Fashion week with an Ethical Fashion Award. After graduating with a BA (Hons), Romain Renoux, Head of Marketing Operations at leading ethical underwear brand, Pants to Poverty offered me a sixth month internship. During my time their as Coordinator of Online Brand and Retail Activism I spent two months with the team in India learning about the cotton supply chain. Returning to England I was offered a Buyers Admin Assistant Role at Marks and Spencer. Eager to work in one of the high street leading figures in promoting sustainability not only within fashion but also food and home wares, I took the role and spent six months in the company. I found that buying was not for me and have since decided to become freelance, supporting emerging, sustainable and conscientious brands with graphic design, social media and marketing. - the reason for quoting this is to promote an employable person, but mainly to add to facts about what kind of operation this was, in reliance on interns, in support from higher education staff, and in ignorance about compulsory insurance as a way of reducing poverty - something people have voted for in the UK for generations but are not allowed to promote in this case. 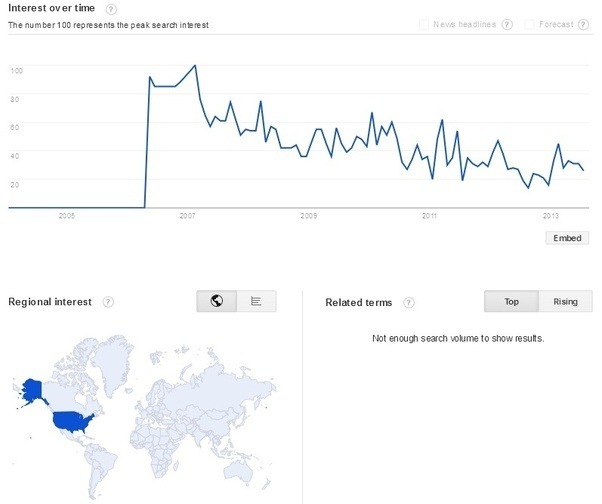 The online presence of all this work is short-lived according to a search for bit.ly/2014-surviving-evidence , done on a date search for 2014 results in March 2018. Nothing survives. When you click on the link you will see the search terms. Take away the date constraint and a lot of general pictures crop-up but nothing to help get work. £ 3,000 is a grant in pounds on top of publicity and any other expenses and costs to other UK underwear manufacturers. "Nobody would have paid me to do this work. Nobody would have allowed me to do this work to their own brand, so I had to set it up for myself"
"People come first ... people we sell our products to ... people that make our products. If we are not talking about people ... then either we are blinkered, or we have ulterior motives .. or maybe we are just not at that stage, just yet"
16/10/14 Price Waterhouse Coopers complete a report on spending by Mayor Rahman at Tower Hamlets Council, channelled to his political supporters at about the time of proven electoral fraud. Ethical Fashion Forum, Pants to Poverty, and their landlord Rich Mix are not mentioned, but Rich Mix looses this group of subsidised tenants within a year, including a charity that employed PR interns for Pants to Poverty and Ethical Fashion Forum, and a group called Ethical Fashion Bloggers. Letters are returned "not known" and the Rich Mix arts centre publishes a list of tenants on its web site, showing nothing related still in the building. Rich Mix and Ethical Fashion Forum have not paid the fee to get a £1000+ charge removed from their accounts at companies house. History.and general background, not directly about Pants to Poverty. This report follows another two reports over the past decade - one by Deloitte and then one by Price Waterhouse - for the assembly and then Mayor of London into the London Development Agency and in particular its arts funding for projects like Rich Mix and the Laban Dance Foundation which were expensive whimsical and useless. The reports I have read are quiet about the tenants of Rich Mix, who got cheap rent rather than cash; there is considerable criticism of Rich Mix itself in the first reports, along with debates in the London Assembly and articles in London newspapers. The reports on London Development Agency, which supposedly funded the organisations to promote employment, found little clear corruption, and a lot of systems removed from the monitoring of public spending so that whimsical political spending can be done. Meanwhile there was a mayor's office in China and a company housed at London College of Fashion which was meant to introduce UK designers to Chinese manufacturers. It was called Creative Connexions and shared a platform with Ethical Fashion Forum for an event called "making it ethically in China". To start-up, it got a large payment from the higher education funding council one year - over 80% of the entire budget - as well as office space at the college, squeezed-in between photography, languages and the students union. So there is evidence of overlapping political enthusiasms by government ministers, regional government, and council government all using underhand techniques to promote far-eastern clothing imports through quangos like the Higher Education Funding Council. London College of Fashion overlaps with some of these initiatives, such as funding for "making it ethically in China", and Creative Connexions. Common themes are attempts to educate the public in an underhand way, a belief in free trade at all costs except perhaps artisan workers in poor countries, and names of public organisations like The Crafts Council, The British Council, The British Fashion Council, the V&A, The Higher Education Funding Council, the BBC (which ran a magazine called Ethical Threads for a while), the Centre for Sustainable Fashion (part of London College of Fashion), and of course an all-party group in the House of Lords. Another theme is silence about UK manufacturers. Remploy, the state-backed clothing company set-up to employ disabled workers, is never mentioned in the same documents as these globalisation plans. Nor any other UK manufacturer, even if the minister for, say, trade, happens to be MP for part of Leicester where a big shoe factory closes. The minister still signs-off a grant to pay journalists to see London Fashion Week, where they promote Chinese and far-eastern fashion at the expense of UK manufacturers. Ethical Fashion Forum: goods from badly-run countries shows-up on search engines from some time in 2014. WebArchive.org got a copy in December so Bing and Google would have got it a bit earlier. The first archived version shows a lot of signs of previous work. 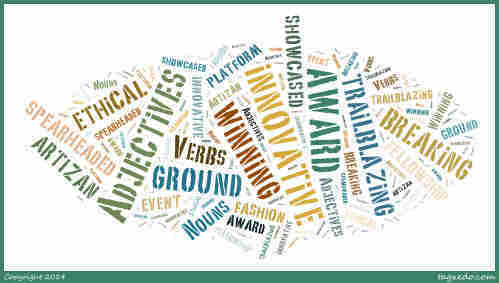 Runner-up for an GLAAXA foundation award; video and transcript of an interview are you Youtube. Department: UK Trade and Investment Programme, Expense type: other. Expense area: Professional Services-Gateway - Export Vouchers (Autumn Statement) Trade Development - Service Delivery. Transaction number: 38653. Amount £3,000. Grant. UKTI funding to Pants to Poverty for these activities amounted to £4,000. ...DIT does not hold any information related to the bus promotion tour as this was organised by the British Council. - Freedom of Information response from the Department for Business - this figure overlaps with the figure quoted in 2014. It doesn't say that the international trade adviser checked whether the firm was doing a maximum amount of manufacturing in the EU before allowing further funding; that system doesn't exist. £ 902 unpaid debt appeared a couple of years later after the company closed. A creditor sued by mistake - possibly RBS with its charge for invoice finance. £223,000 directors' soft loans were probably partly repaid from bondholders' loans or turnover, and probably partly un-paid; the director left. £ 53,998 restricted grant money already received but intended for disbursement in the following year remains a mystery from the 2006 Pi Foundation accounts; linkedin suggests "Philanthropic donations" after previous funding in Euros for Zameen Organic petered out. These are figures not declared as profit or loss on the main accounts at the top of the page. 00/09/13 An experienced "Managing Consultant" joins to help Pi Foundation on a 13 month job that is also called an internship brokered by the School of Oriental and African Studies (SOAS) "The experience has been invaluable and Id definitely recommend students to apply to Santander Universities Scheme" which SOAS presents as an ordinary student getting help from Santander to gain work experience. The job is to develop the claimed "accounting in 3D" and "Coordinating industry coalitions, academics, consultants and corporates in building consensus and awareness around the tool", as an interns do, and to be shortlisted "global leader in sustainable apparel"
planb4fashion.blogspot.com/ and facebook.com/planB4fashion/ spring-up in response to an "ethical fashion show" in Hammersmith with a stage for Pants to Poverty and Ethical Fashion Forum to pose together as experts while promoting goods from badly run countries. The July date is from an exchange with Ethical Fashion Forum, in which they decline to comment on removing their "issues: made in Britain" page. They had previously decliend to change the page after a piece headed "£225 buys you an exclusive view of ethical fashion" about their expensive ticket-only trade show for ethical fashion at which Pants to Poverty exhibited. Ramsden is interviewed about "thousands of farmers" while lobbying the Department for Business, a UK ministry, for Social Enterprise UK, an arm of The Cabinet Office, to suggest public support for imports or social enterprise. 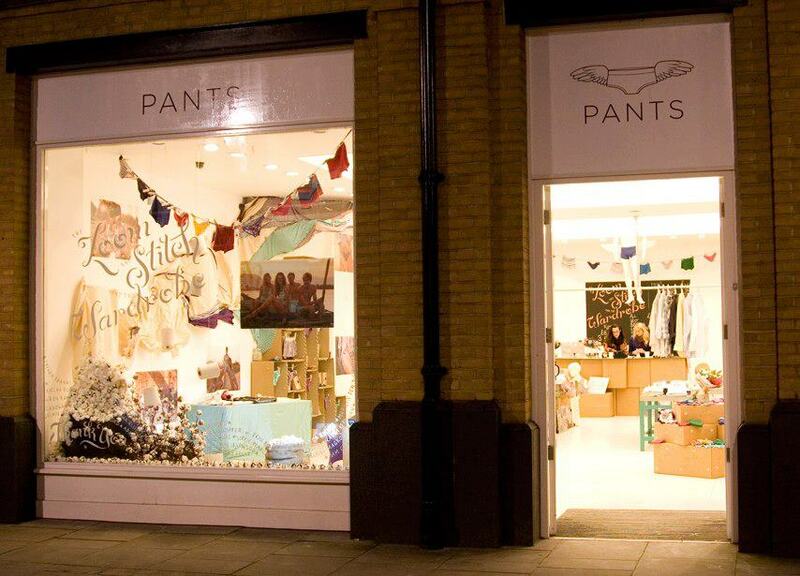 #pants-investments- offer quoted further down the page with publicity from Social Enterprise UK. Pants hope for another round of funding to follow. https://fundit.buzz/bonkofpants shows 104 investors paying £58,365 between them for poverty bonds that were meant to pay them back 3% a year. There is no discussion on the fundit.buzz web site, for example of previous crowd funding and whether it had been paid-back. Incentives included promises of discount vouchers and access to an "advisory board" for company 06445650, which provided one more set of accounts, delayed to 2014, and was then struck-off for providing no accounts in 2015 and ceased to exist. Meanwhile a leaflet from the Big Lottery Fund called "social enterprise explained" still quotes the scheme as a good example and states that the money was paid-back. "the company released pants bonds to raise £12,500" from 2011 accounts, released in July 2012 and commenting on the next year. Deloitte selected a cohort of the leading Social Businesses in the UK after a thorough interview process. We were selected as leaders in our category for which we had the opportunity to share our knowledge with Deloitte staff about our impact and in return receive some organisational support. March 15th: "Mary's Bottom Line" starts on TV, revealing to people who didn't know that there is a little-known and fragile underwear industry surviving in the UK. "Knickers to unemployment" is a phrase that comes-up. "It's the most brilliant thing I've ever done and I'd love to do it again". Begging the question: why would someone offer an award for importing pants from a sweatshop state when they can be made in a welfare state? What sort of person would do this? Where did they learn their economic theory? Alternative accounts shown at the bottom of the page. They state that no tax was paid towards the welfare state in the one year of profit, although there is some tax and national insurance in the Pi Foundation accounts - it doesn't seem important to the people who write the accounts. Nor did the company work under usual UK employment law, as its UK staff were often interns. They don't state the same as the Companies House accounts, maybe because of different year-end dates, which also different between company and charity so you can't guess anything about amounts paid by Pants to Poverty to Pi Foundation; Pi just has the usual charity categories of restricted grants and unrestricted donations; it doesn't say where the money came from or where it went to. Alternative accounts do not include the cost to the UK economy of campaigning against UK manufacturing under a pretence of being part of an industry body. "During the year the company donated £2,369 (2010: £1,169) to the Pi Foundation, a registered charity." These amounts are similar - the same kind of scale - to the total money paid-out by the charity in those years. The charity accounts end a month earlier each year. "Pants to Poverty was included on the UKTIs Passport to Export Programme (November 2011 to November 2012) ... access to different types of support, including advice and guidance provided by an international trade adviser, and access to the wider UKTI overseas network." "the accounts are to be audited in December 2010" - but in about December 2010 the director with an accountancy background, Jay Dais, resigned and the accounts were not audited. The accounts give a very rough idea of profit and loss and more detail about turnover.Taking wholesale and retail together, there is about a zero profit margin after "cost of sales" and "distribution", leaving an un-paid heading called "administration" of £118,000 or £67,000 the previous year. This included some director salaries of £13,063 and £3,316 the previous year but was paid-for by large director loans - gifts in effect - building up to £223,000 by the end of the year. So someone donated £223,000 to help close factories that work in a welfare state. Linkedin quoted some connected CV, including people "including", "for", or "at" pants to poverty, when searched in December 2016. "including... Pants to Poverty " or "for ... Pants to Poverty" were CVs of people who worked at Indian factories or contractors. The Indian factory is high-tec; staff are often on linked-in. Contractors in the UK are sometimes freelance, such as models, photographers, or couple of designers who did the short-term pop-up shop in Sloane Street, sometimes free or "pro bono" such as the ad agency that did a rather worrying film about someone having their pants removed. A more careful search would reveal what the others did. At a glance, the 33 "at Pants to Poverty" look very employable but ran-up costs. There was a warehouse to pay from the start; now there was an office-full of people on low wages who did not make pants or post them. One did wholesale, customer complaints, and photography. One tried to make sense of the system of credit that allowed cotton to be owned all the way through the supply chain. She gets freelance work at London College of Fashion now, explaining how it was done. There is a video of the office crammed with a queue of modelling applicants, in a room full of people doing anything but sew. One CV mentions graphic work on Adobe Photoshop, Indesign and Illustrator. Maybe begged or borrowed, but costing high hundreds of pounds to buy at the time. There were a few costs of £15 - £100 a month. Someone else in the office was good with Shopify, a paid-by-the-month shopping cart program that integrated with Sandbag, a pay-by-the-month warehouse and a paid-for web server at Juno web design who offered web support and design. Another introduced Salesforce, a pay-by-the-month customer relationship manager programme. There was a pay-by-the-month landline, and the subsidised pay-by-the-month landlord office space was in a crowded part of London where people needed travel expenses to arrive, even if they were interns as plenty were - recruited through Enternships or a Cycle-to-lecture and general internship charity called Otesha.org.uk including a group called "ethical fashion bloggers" in the same office block, or Brightone that organises PR internships. Most or all of these agencies needed paying, on top of what the interns got. And working from an office made it harder to grab a snack, so there were pay-by-the-lunch lunches to fund as well. The office was shared with a trade association that had a paid administrator, so there was a pay-by-the-year membership fee. The pants2poverty.wordpress.com blog was unusual in being free. Some of the jobs were unusual in paying a salary rather than something called "paid internship", volunteering, pro-bono, or student project. The sequence of jobs before and after "executive assistant" suggests an average wage for central London, so those jobs might have paid £2,500 a month each plus employers' national insurance, liability insurance and payroll costs. Or the person could have taken a pay-cut to work alongside a director who got a thousand a month for whatever number of hours. One CV reads "I started at Pants to Poverty as a paid intern, got employed after 6 months and have been managing the entire ship during several month when the owner (Ben Ramsden) was away. ", including "handling complaints". 23/06/09 Masterclass: Funding and Finance: Identifies specific challenges and opportunities for funding for small to medium enterprises in the ethical fashion sector. 03/06/09 Observer Ethical Business Award Finalist...The Observer Ethical Awards are instrumental in bringing green issues to the forefront of consumer minds and making businesses reassess their attitudes towards sustainability. The awards recognise those who pioneer a sustainable future and identify products, ideas and companies that make ethical living possible. The entrants were judged by a combination of reader votes and by a celebrity panel that included; Jo Wood, Ben Okri, Rick Edwards and Deborah Meaden. The triangle saying "made in Britain" is an Italian design copied off the web site of Equitector shoes, a firm which had to close its factory because of lack of interest in UK manufacturing. The site is still online, now that they get their shoes done by another firm, and you can see a "factory tour" page of the people made redundant by organisations like Ethical Fashion Forum. "The deferred income of £53,998 are restricted grant money already received, but intended for disbursement in the following year"
The note doesn't say where this money comes-from, but Unltid.org.uk were used to give-out cash from a Cabinet Office social enterprise fund, and Dfid are thanked by Pants to Poverty and others for engagement with civil society in trying to achieve millennium goals. The government set-up a Millennium Commission, as you do, with UK taxpayers' money, as you do. There is a series of similar statements about funding in the accounts of Pi Foundation Ltd. Someone moved from Zameen Organic - that got funding in Euros - to Pi Foundation where she got "philanthropic funding" of $145,000. The person has also done consultancy work fo rhte UK government according to Linkedin. So it looks as though staff were seconded or funding was provided or that a consultant used funding to be paid to work at Pi Foundation. There was a hope of fiunding more similar work from pants sales, but statements like "we funded" from Ramsden mean "we as taxpayers" rather than "we as underwear buyers". Ethical Fashion Forum's similar founding member, Terra Plana, had been a fellow traveller in shared publicity photos and similar guest-speaker events. David Cameron had worn a pair. But the shared publicity no-longer helps after it emerges that the shoes are made at a Chinese factory with labour problms. Terra Plana claims on its web site that China is the only country in the world where you can make modern shoes, and, later, quotes a Chinese supplier saying that "China is arguably more democratic" than the UK. The business found some European wholesale customers. Fewer press mentions - only a few pages of google listing survive ten years later for "pants to poverty" minus "say pants to poverty". Trademark registered in Ramsden's name - took a year to be accepted - later expired. "In 2006 I just decided to go for it. We decided our product would be Fairtrade cotton underwear and called the company Pants to Poverty, and from a loan of £3,000 we sold 11,000 pairs in just six months." - statement in The Guardian - undated Society Guardian piece from 2011 "Custodians of a Brighter Future"
"We started off with us cobbling together £3000 amongst us and then pre-selling enough stock to pay for the order. Within 6 months, we then sold 11,000 pairs to fund all our Make Poverty History campaigning work and put some cash down for the next order. 2005 was the year that the multi-fibre agreement, protecting welfare state countries from sweatshop competition, ended, and crass ignorant people thought this a good thing. The year of the Gleneagles Summit with its fear of protest and new government-funded protest provided instead. It was also the year that M&S made a financial mistake and compensated by moving all their UK production to the far east. In theory there was the Department for Business, regional development agencies like London Development Agency, and all of government ready to take whatever action voters and common sense told them to do. Not the Olympics for example. That was one of the more respectable things that London regional government wanted to do at the time, all done with goodish intentions in a system of private and un-accountable decision-making according to forensic investigations by Deloitte for an all party group of London Assembly members, and then Price Waterhouse for the next Mayor. Journalists were polite about Ethical Fashion Forum, which sounded a bit like a charity (in fact it technically was a charity) but there were pages of column-inches about Rich Mix Cultural Foundation, which spent years knocking-down a perfectly good industrial building and building it up again at public expense. It was a favourite topic of London's Evening Standard to report their latest bit of bonkers spending. Rich Mix Cultural Foundation was slow to open their free office space to the likes of Ethical Fashion Forum and Pants to Poverty, who used desk space at The Hub, Torrens Street, and a forwarding address from Rich Mix for when their space was ready. The launch alongside Make Poverty History and the new address was just in time - another EFF member called Ciel called their new membership "long awaited". Some kind of central or exclusive planning happened, and a scan of freedom of information requests on Whatdotheyknow.com finds other people searching another such group called "Common Purpose", which doesn't much overlap with Ethical Fashion or Pants on Google, and "Forum for the Future", which does. This is what The Hub Torrens Street said in 2005. The terms on which subsidy to Pants and Ethical Fashion Forum via Rich Mix giving them free rent are not clear. Rich Mix received millions of pounds of London Development Agency money but is not subject to the Freedom of Information Act and has chosen not to answer questions, but a decade or more later it chose to return mail to Ethical Fashion Forum as "not known" and display a list on its web site of all tenants, none of which are related to this crowd. Google Trends' graph on the right shows international searches for "ethical fashion" since 2004. 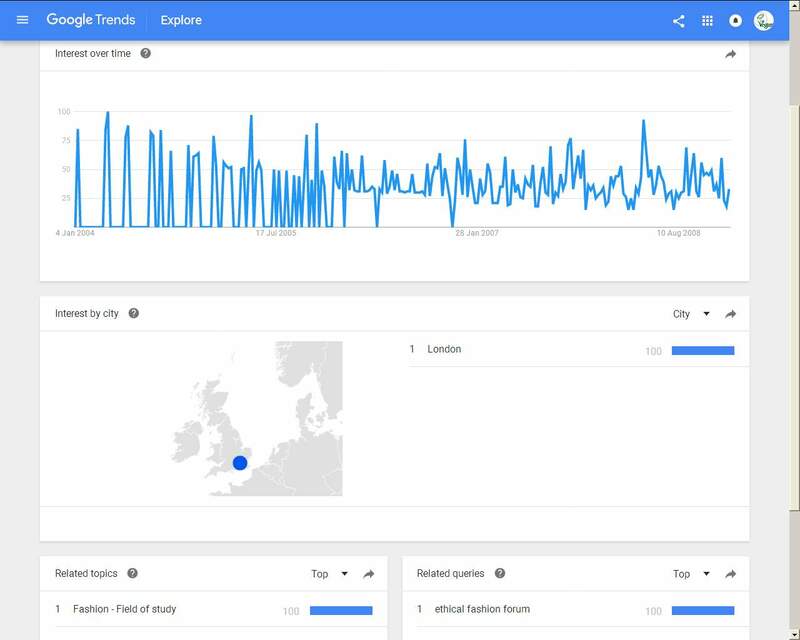 A much more detailed search for the UK finds them all in England, mainly London, beginning with a series of spikes of interest that fall back to less than 1% of the peak, and associated with only one other search term, which is "ethical fashion forum", the lobby group where Pants to Poverty was based. Before 2005 there's a good chance of co-ordinated activity between ministries to encourage the appearance of a popular, grass-roots movement for globalization and against social insurance. It's a good guess that students on Chevening Scholarhsips, Great India Scholarships, or Great China Scholarships to study in the UK were encouraged to volunteer for related charities and companies, in a tradition that continued with internships. For example, the person quoted as a founder member of Ethical Fashion Forum and founder of "Sari Dress Project" looks like an overseas student keen to do volunteer work rather than a founder of a business, although she did have a job as a shop assistant for a while. Pi Foundation company accounts show the same amount in and out as the charity accounts, and a previous year with more turnover. They're not written to explain what the charitable company did beyond support activities for crop production in London and India, nor who paid. There is a loan of £53,998 repaid about the time of the bond issue, money from grants and donations, and expenses including tax and social security. The last set of accounts is more detailed and says that none of the trustees had any expenses or salary. The last major payments were from the Pantrepreneur scheme. The first years' accounts look more like a trading companies accounts, with cost of sales and fixed administrative costs about the same and a small loss, but no distribution costs. "Income consisted of restricted grants of 26,860 and donations of 3,092". Benefits appear to be copied from the Chetnya Organic web site, so presumably the Pi Foundation was meant to help Chetnya. 2001 "pants to poverty" - a slogan of comic relief in 2001, backed by celebrities and BBC broadcasts, leading a large number of people to associate the phrase with charity and aid. &COPY; Pantstopoverty.org.uk - the site you are reading - has no link to companies 09566221, 09566221, 09826547, 07035546 nor Pantstopoverty.com associates & neighbours Ethical Fashion Forum formerly at Rich Mix, 35-47 Bethnal Green Road, London, E1 6LA - try linkedin and companies house. Pants to Poverty &REG; is no longer a registered trade mark. This site has not benefited from exhibitions at the V&A, The Crafts Council, The British Council and the British Fashion Council and promotion by their public relations staff. Veganline.com is not a Deloitte Social Enterprise Pioneer and has not received their help with PR. It has not received soft loans from government channelled through Unltd, the social enterprise finance company. It has nothing to do with the world Sustainable Fashion Summit in Copenhagen, 2014, and does not have an all-party group in the House of Lords debating it.